The CTARC met for an extraordinary external meeting at the South African Astronomical Observatory, in Observatory suburb, on 28 March 2015 at 18h00. It really was an enjoyable, sociable event. First of all we gathered on the southern side of one of the lecture halls, under a covered awning, to hold a picnic as the sun went down. The wind, which had started off rather fiercely, was not too much of an issue even though we were outside. At about 19h00, we cleared the tables and trooped indoors to the lecture theatre. There we were introduced to Ruby, a most knowledgeable lady who gave us a fascinating slide show on the various Radio Astronomy projects - the Meerkat and Square Kilometer Arrays - that are being built (and in some cases, already being used for scientific research) at Carnarvon in the Karoo. We had the opportunity to ask her questions, which were most adequately answered. At 20h00, the main meeting of the South African Astronomical Association's Cape Town branch took place. Some elected to stay for this interesting meeting. Others were given the chance to take a look at the Observatory's main telescope. Adjacent to the main telescope chamber is a fascinating museum, full of astronomical equipment, chronometers, models of the large SALT telescope at Sutherland, and other interesting displays. The main telescope is housed in a typically domed observatory building to the East of the main office building. It has a few tricks up it's sleeve! 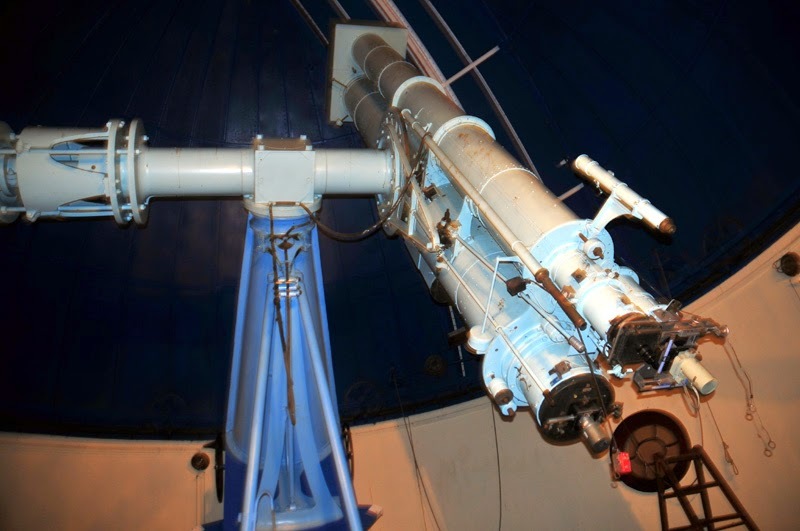 In order to reach the eyepieces of the instrument - a beautiful refractor telescope from the turn of the century - the entire floor in the observatory chamber can be raised up or down! The CTARC is hugely grateful to Ruby and the South African Astronomical Observatory for providing us with such an interesting evening. Photos of this event are found in Batch One and Batch Two.